Former sponsored member George cooks a chapatti at his roadside food kiosk in Kenya. 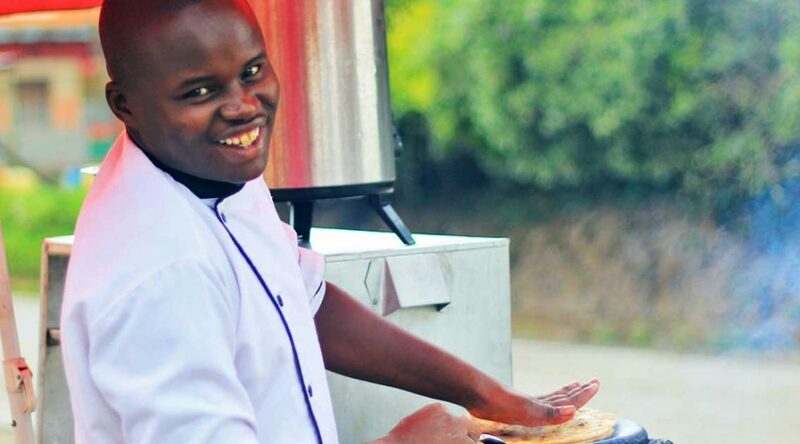 With a smile on his face, George kneads and rolls the dough on a wooden table at his roadside food kiosk in Kenya. The cars tooting their horns, the speeding motorbikes and the pedestrians are not a distraction to him; in fact, the commuters and passersby are his clients. Every few minutes, someone walks up to him and buys a chapatti or mandazi, which are both snacks made of wheat flour. George, the oldest of three children, was born and raised in Nakuru, a city northwest of Nairobi, in Kenya’s Great Rift Valley. Young people in slum communities face many challenges. Peer pressure to engage in vices has become a norm. While trying to escape the harsh reality that is their life, many find comfort in the company of people who steer them on the wrong path. George says he took a wrong turn in life. He decided to quit school, even though he was sponsored through Unbound and never lacked anything to facilitate his studies. According to Amos Kihoro, the youth programs coordinator for Unbound’s Nairobi office, the issue of students dropping out of school isn’t unusual. Life out of school was not as rosy as George had imagined it to be. He started feeling restless about his decision to drop out. To make some money, he started working at a local hotel washing dishes. As with similar cases, the staff wanted to help George find a path forward that would allow him to continue his education and stay in the Unbound program. George felt that he had also let his sponsor, Dianne in New York, down, and that weighed heavily in his heart. His eventual decision to go back to school was met with enthusiasm from the staff, which made him feel more confident. George took up a course in food and beverage production. It took him two years and three months to complete it. While he was still in school studying, he started cooking chapattis and other snacks at his food kiosk every day after school. “I wanted to make my sponsor and my mother proud of me. I owed them that,” he said. Now a husband and father, George has some thoughts for how he will raise his young son. 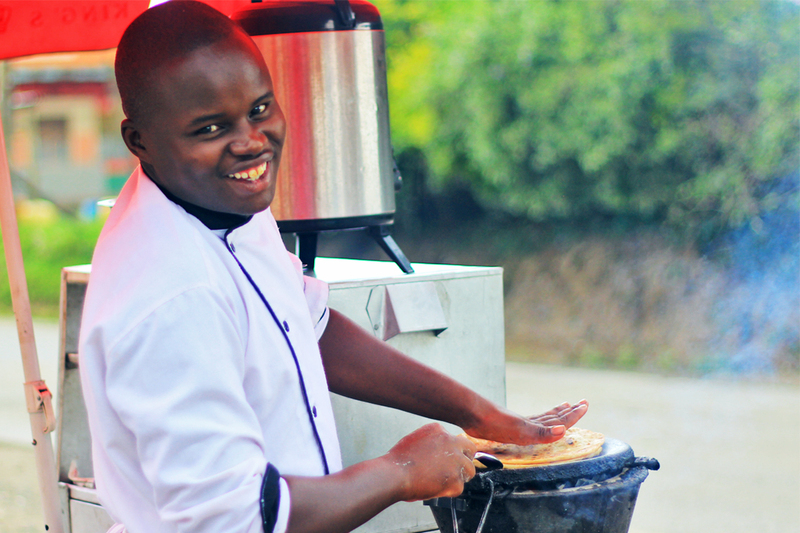 Besides selling snacks by the roadside, George works part time as a chef in a local hotel, and he hopes that soon he will be employed full time. Every young boy and girl has a dream etched in their heart. For George, the original dream was to become an engineer. Life hands all of us the gift of second chances. You can work with what you have in your hands and make the best of it. George is proof that yesterday’s mistakes are steppingstones for the future. Help a youth find their path. Sponsor today. Regina has worked with Unbound in Nairobi, Kenya, since 2009. 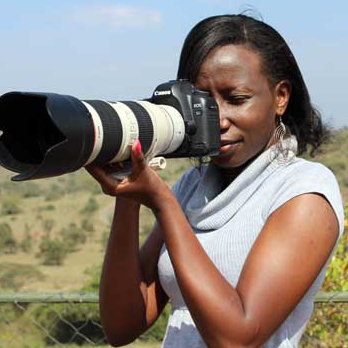 She leads the communications center in Africa, capturing stories, photos and video of sponsored persons and events in Kenya, Madagascar, Tanzania and Uganda. I have sponsored a child or two with Unbound for several years and it has been a pleasure and a joy to receive their welcome letters. I look forward to their next letter and their life experiences.